Andy has been the grounds manager at the illustrious Shrewsbury School for nearly eight years and he and his team of eleven groundstaff tend to 120 acres of green space – three quarters of which are sports pitches. In addition to synthetic surfaces and other world class facilities there are ten grass pitches which cater for the School’s highly competitive sports teams. The boys compete internationally in cricket, and Shrewsbury School boasts a string of historically strong football teams. Rugby is played at a high level and girls compete locally and nationally in hockey, netball and tennis. It’s no wonder then that with over 800 pupils, many of whom participate in sports, that the sports pitches endure an incredibly high amount of usage. This, however, does not keep Andy and his team from maintaining them to an exceptionally high standard. Andy chooses to use a variety of equipment from Dennis to get the best out of his sports surfaces. 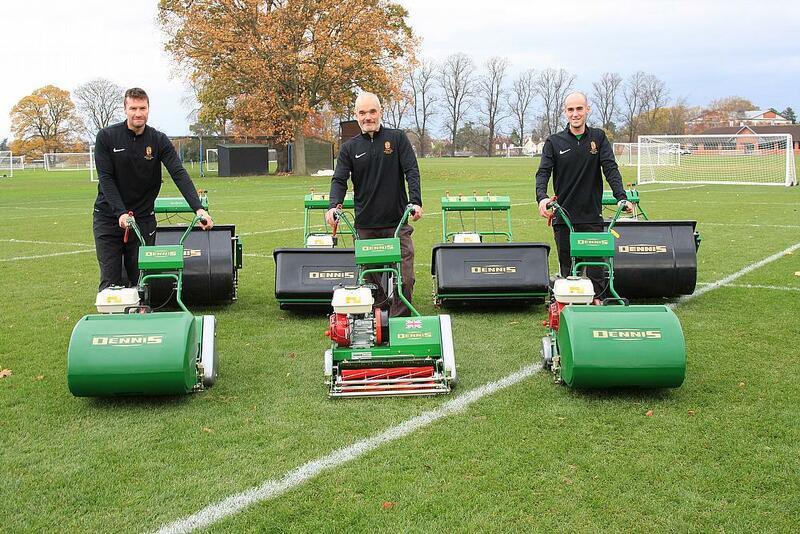 For cricket square maintenance he uses his three Dennis FT510’s and for football two G760 mowers. The Dennis FT510 is an interchangeable cassette cylinder mower giving users options to fit twelve different cassettes including scarifiers, verticutters, brushes, spikers and slitters as well as 5 or 10 blade cutting cassettes. For his football surfaces, Andy revealed that he is an advocate of hand mowing and that he uses his G760’s in conjunction with his Dennis Premiers: “I’ve always been a fan of the G760’s and originally we used them on the cricket squares. However, we started hand cutting the first team football pitch with them and we have the added bonus of using a variety of different cassettes such as the verticutter and brush. “To allow us to mow more pitches by hand we use the G760’s alongside the Premiers which have a slightly wider cut and it gives us a good contrast with the G760 because that is slightly smaller and slightly lighter. When the pitches are wetter we can get on with a G760; on other occasions we may veer more towards the weight of the Premier. With such a hectic schedule, Andy was also quick to praise the reliability of the machines and the back-up he receives from the Dennis team.